Hello! Today I have a super quick swatch of Colors By Llarowe (CBL) 'Shimmer Me Timbers' to share with you. This is an older CBL that I recently picked up in a destash. I'm not going to lie, I bought it mainly for the name. I am obssessed with both puns and pirates, so I absolutely had to have it. It helps that it is a gorgeous colour too though! Read on for my swatch and more info! 'Shimmer Me Timbers' is a deep purple linear holographic with what appears to be tiny pink flakes. This was released as part of The Mystery of the Vanishing Pigment Collection, so I believe the exact pigment is no longer available. The formula is smooth and easy to apply. It was a bit patchy on the first coat, but a second evened it out nicely. Below is two coats and topcoat. What do you think? It's a shame that this pigment is gone, just look at it - it's stunning! 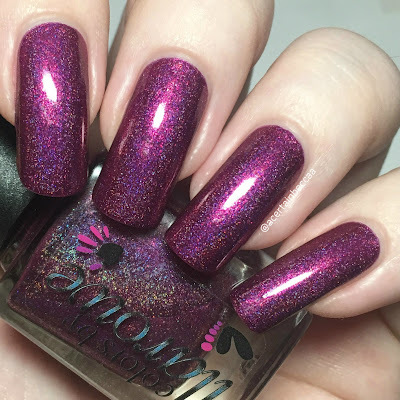 I'm really happy I managed to get my hands on this polish, and not just for the name! I only have a handful of Colors By Llarowe polishes, but I haven't been disappointed by a single one. As mentioned, this is an older polish and is no longer available. You can find plenty of other Colors By Llarowe polishes over on their website here. 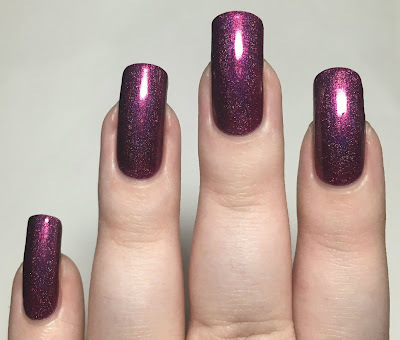 That truly is a gorgeous polish! that is sooo pretty! just my kind of colour! WOW! I'm digging this color - the name puts it over the top - I mean how cute is that name! :) I don't blame you for picking it up for the name alone. *gasp* how could you make me love this and then tell me it's not available?? OMG your pictures! 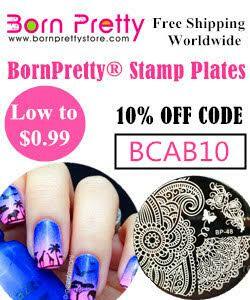 This reminds me why I collect CbL polishes like crazy! Very pretty vampy shade!!! Love!! !